Tempo Ultra WP is a pyrethroid-based insecticide that is highly effective at controlling a broad range of insect pests, especially those found on turf and landscape ornamentals. Tempo Ultra WP provides a fast knockdown and kill and leaves a residual that keeps killing insects for up to 30 days. Tempo WP has a no odor and leaves a clear, almost invisible residue. Tempo Ultra WP is a wettable powder concentrate that is mixed with water and applied with a sprayer such as the Chapin Premier 1 gallon hand pump sprayer. Once applied according to the label directions, Tempo Ultra WP dries and leaves a residual of active ingredient for pests to contact for 30 to 90 days. The active ingredient in Tempo Ultra WP is Cyfluthrin, a synthetic pyrethroid that attacks the central nervous system of target pests. 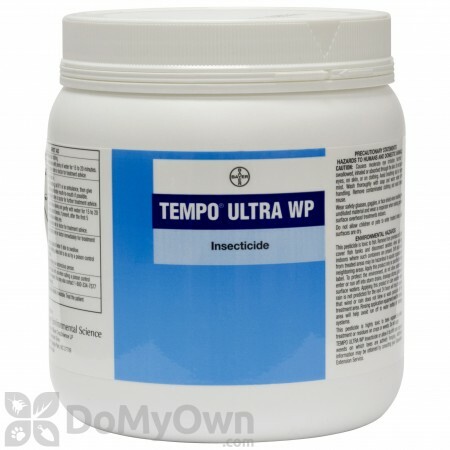 Though Tempo Ultra WP is tough on insects, it is very gentle on people and pets when used correctly. A wide variety of crawling, flying, and wood-infesting pests for indoor and outdoor applications, as well as insect pests of trees, landscape ornamentals, and residential and commercial lawns; general household pests, pantry and stored product pests, and food processing pests. Tempo Ultra WP is a superior choice among outdoor perimeter treatments because of its rapid knockdown of a broad spectrum of insects. Equally effective at controlling structural, ornamental and turf bugs, Tempo can also be used in food-handling establishments. Tempo Ultra WP leaves a white powdery film that may be visible on darker surfaces. For applications where this is a concern, consider using a liquid concentrate, such as Tempo SC Ultra. To mix Tempo Ultra WP: Fill sprayer tank ½ full with water. 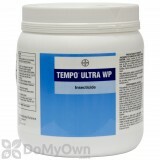 Add appropriate amount of Tempo Ultra WP, then allow 1-2 minutes for product to dissolve. Stir, agitate, or shake applicator tank to mix. Finish filling applicator tank with water and agitate again before use. If tank rests for 30 minutes or more, agitate again to ensure adequate mixing and proper application. Use Tempo Ultra WP as a general surface, spot, mist, or crack and crevice treatment in and around buildings and structures, or as a broadcast application to turf and foliar application to ornamental plants. Reapply after 7 to 10 days as needed. For turf, do not apply more than 6 times per year. Use 10-20 grams of Tempo (measuring scoop is included) per gallon of water in a hand sprayer. Use the higher concentration (20 grams) for severe infestations, faster knockdown and longer residual and also for control of bees, wasps, yellow jackets and hornets. Apply spray onto baseboards, window frames, door frames, and cracks and crevices where insects are known to harbor (such as under the refrigerator, sink, cabinets, or stove, around pipes, etc.). You may also spot treat floor areas under furniture or in closets and storage areas. Do NOT treat entire floor area. Do NOT use as a space spray. Reapply every 7 to 10-days if needed. Tempo Ultra WP will last up to 90 days indoors. Pantry and stored product pests – Clean area before treating. Remove and destroy infested food. Discard food accidentally contaminated with spray. For cupboards, sheling, or food storage areas: remove utensils, exposed food, shelf paper, and other items before spraying. When dried, cover shelves with clean paper before replacing items. Use 10-20 grams of Tempo (measuring scoop is included) per gallon of water in a hand sprayer. Use the higher concentration (20grams) for severe infestations, faster knockdown and longer residual and also for control of bees, wasps, yellow jackets and hornets. Apply spray in a 3 ft wide band around the base of structure and also around door frames, window frames and soffits. Spray a band 3-10 ft wide around the structure on the ground. Spray cracks and crevices around foundation where insects may harbor. Cluster Flies and similar over-wintering pests – Treat in late summer or fall, just before flies begin looking for winter shelter. Spray siding, eaves, around windows and doors, window screens and attics. To help reduce infestations, treat cracks and crevices, attics and other indoor winter hiding places. Note: Pests may appear during warm winter spells, while snow is still on the ground. Scorpions – Treat around piles of firewood and other areas where scorpions may hide. When possible, remove piles of materials that can harbor pests. Apply a perimeter treatment. Turf and ornamental pests – Use an accurately calibrated sprayer. Apply uniformly. Apply when pests first appear. Reapply as needed based on pest reinfestation. Do not treat more than 6 times per years. Consult your Cooperative Extension for specific timing in your area. Quick knockdown and residual control. No phytotoxicity on a wide range of ornamentals. Easy to measure with enclosed scoop. Broad and comprehensive label of pests and locations make for a versatile product. Pet safe when used correctly. Tempo Ultra WP may be tank mixed with other pesticides registered for similar uses. Tempo Ultra WP may be used as a foam for treating structural voids. May be used in food and non-food areas of food handling establishments. Tempo Ultra WP should not be applied with oil. Do not use Tempo Ultra WP as a space spray or with equipment such as misters, foggers, or aerosol equipment. The product will clog or damage the equipment and is not labeled for this use. Store out of direct sunlight and extreme temperatures for maximum shelf life of 3+ years. This is my second purchase of Tempo WP. I was paying $70.00 a month for a pesticide service to spray for bugs and I finally asked the guy; What do I get to do this myself because the stuff you buy from Lowe's or Home Depot is crap and it is not as strong as this stuff. One jar of Tempo WP has done great around one house that is 2400 sq ft and another at 2200 sq ft and inside and outside of a 2200 sq ft garage. All this I spray liberally and it has lasted me 1 year. Everything and I mean everything dies and is no match for this product. This product kills Black Widows, funnel spiders, wolf spiders, brown recluse spiders, all types of ants, centipedes, millipedes, earwigs, springtails, silverfish, just to name a few. Do not drench the area that you want to treat; just get it wet enough to where you can see a gloss from it. Do not spray around your family pets. Once this wettable powder is dry you are good to go. Once you spray thoroughly, within a day or two you are going to see so many dead bugs, you didn't know you had. I have saved sooo much money with this product and will not buy from any other site except www.domyownpestcontrol.com. They have extremely fast shipping, I live in CA and I had my product within 3 to 4 days. I highly recommend this for ALL your pesky bug needs. We recently purchased a house in the country and could not believe how many wasp and dirt dobbers and just bugs in general that lived in the country, so we asked a professional about what to use and he said this is the best. We have used it only 2 times to really get rid of the bugs on the patio and to keep the dirt dobbers from building their nest on the patios and this stuff is THE BEST. It really has worked and arrived in just a couple of days after ordering it, since then we have purchased other items from this same company. Wish I had found out about this place a long time ago. Well I am a first time buyer and they say Fast Shipping, they are not playing. I ordered on Friday, got it on Monday - wow talking about fast shipping. I use the Tempo Ultra WP, I follow the instructions, and I can be honest about this the roaches went crazy. This is better than any thing that you buy in Home Depot or any other store. If you are going to spend money on junk that does not work, better buy this product. Yeah, it costs more than a can of roach kill, but it works. Thanks! This is a follow up after the season. I used Tempo Ultra extensively in August-October. There were hordes of Stinkbugs, then piles of dead stinkbugs. This stuff works! Last year we killed between 50 and 100 stinkers each day inside the house from mid October until April. No exaggeration. This year we have found 10-15 total so far. That is a huge difference. I have recommended this product to everyone who has asked, and everyone asks…I ought to get a commission. They are an enormous problem here, affecting everyone. Anything that kills large numbers at once attracts interest. I have also passed on your website as a good source. What is the difference between Tempo Ultra WP and Tempo SC Ultra? I live in the country and need something for general bug control, but mainly for wasp. Tempo SC Ultra is a concentrated water based liquid insecticide that will need to be mixed with water while the Tempo Ultra WP is a wettable powder that will need to be mixed with water. Both products contain the same active ingredient and will provide similar results. Tempo WP will do a better job on porous surfaces as it will stay on the surface and be more available to insects. Tempo Sc on the other hand will dry clear and will not leave behind the powdery residue that Tempo WP can. How do I mix Tempo Ultra WP correctly? To get a .025% solution of Tempo Ultra WP you need to mix 2 scoops of powder per gallon of water. Is Tempo Ultra WP harmful to animals? Tempo Ultra WP is not harmful to animals or pets as long as you follow the product label instructions. You should only apply this product to appropriate areas, and of course you would not want to apply it on children's or pets toys. You should keep pets out of the room while you are applying the product, then wait 30 minutes for it to dry. Once the product is dry, it is perfectly safe to allow pets back into the room. Does Tempo Ultra WP help control mosquitoes? Tempo Ultra WP is labeled for mosquito control. The product label recommends spraying areas where mosquitoes may rest such as landscape plants, ground cover, beneath decks, around foundation and other areas where mosquitoes may rest. Can you explain the difference in the two active ingredients or the pros/cons of both Cyper WP and Tempo Ultra WP? I see you often recommend Cyper WP (Cypermethrin 40.0%) for spider problems. The reviews on Tempo Ultra WP (Cyfluthrin 10%) seem to be very good regarding spider and scorpion killing power. Can you explain the difference in the two active ingredients or the pros/cons of both? Both Tempo WP and Cyper WP contain active ingredients that are synthetic pyrethroids. Tempo WP and Cyper WP are both excellent choices for scorpion and spider control and will provide very similar results. We often recommend Cyper WP over other WP products because our customers are not only looking for a quality product but they want it at the lowest price point possible.